Years ago, Jen and I were in an airport with nothing to read. So, like so many other hapless victims, we decided to peruse the local den of thieves (aka airport gift shop). On a whim, Jen picked up Harry Potter and the Sorcerer's Stone. Little did I know that that would be the beginning of what has become a minor obsession in my life. We've been to midnight book releases, I listen to the audio books at work over and over, and naturally I'm far more excited about the movies than any grown man probably should be. So, with the sixth film coming out this Wednesday, I asked Jen to let me do this week's Sunday Sweets. Now, put down those Fizzing Wizzbies, and let's admire the works of some of the finest Muggle bakers around! We're pretty sure that's either a chocolate or butter cream transfer on the top - cool, huh? I found it on Decolicious! 's Flickr stream. "All was well." [tearing up] This is so beautiful. It's from the aptly named Mike's Amazing Cakes. I think this was for the last movie's premier. Little kids reading 800 page books - now THAT is Sunday Sweets worthy. Great cakes! The SECOND best thing about Harry Potter books is getting kids to read. The BEST thing about Harry Potter is that is the name of my collie/border collie cross who is the joy of my life! i love your last shot of the little guys reading. so true! and i can't wait for wednesday's movie release. actually i'm seeing it tuesday - our friend's father owns a movie theatre and we get to view it early - yay!!! Those are some nice cakes. I defiantely agree John, if it gets kids to read, then who cares if you hate the series. I may not have fallen head over heels for the books when I read a couple of them, but the fact that my sis who couldn't make it through most of the books I handed her that were pretty short would pour through these was an inspiration. Love the cakes, but that Sorting hat is the best! Those cakes are wonderful and I'm glad I don't have chose which one is "the best", although as a librarian I must admit that book is terrific. WV Synalk=After seeing these great cakes, I'm not such a synalk about the baking business. THAT HAT IS FABULOUS! And I have my midnight ticket safely in hand. *Personally, I like the book cake. I too am an adult (mid-40's WWF) who completely and totally LOVES the entire series of books and all the films. My 14-yr-old child thinks I am insane. I also play the video games, which could have been done better. But I think I have found an ally in you! OOOh now I'm all excited for the new movie... AND movie cakes. Yay. Kids reading... awesome. Way to go, JK. Amazing cakes and perfect parting shot of the little ones reading. We are HUGE Potter fans as well - I bought the first one to read to my son when he was in kindergarten and as soon as I finished he grabbed it and re-read it himself! You are so right our middle daughter didn't like reading untill she started these books. In 7th grade the teacher said the books were somewhat younger but she let her use the pages to make her quota. This gave her so much confidence in reading just what she needed! The cakes were amazing too, Love the Hat!! Can't wait until next weeks!! Thanks again!! yay! going to see a sneak preview of the movie tonight..if the theater's not completely packed! Well done, John, Hubby of Jen (sounds like an old english name). The cakes are great. I like the variety you chose. Looking forward to the movie and more cakes next week...and oh heck, the movie again. I love how we blogged about Harry Potter at the exact same time. And I'm not going to lie - the "all was well" cake did make my eyes water a little bit. I love how we blogged about Harry Potter at the exact same time. All of those cakes are amazing but, the last picture is definitely my favorite. i dont like them very much at all i read most the series and then got bored partway throught the last one but i am surrounded by harry potter lovers. omg! i've read all the books in less than one week, and i'm twelve years old! Awesome to see small children reading by choice. Am I the only one on the planet who has never read a Harry Potter book or seen a movie or never even wanted to? They may be great but by now they have been so extremely and completely overhyped there is no possible way they can live up to expectations even going in thinking "They've been overhyped. Don't expect perfection." I was a supervisor for Borders Books for a number of years and as *insane* as the midnight releases could get everything was justified when I saw hundreds of kids promptly finding a space on the floor to crack into the new book. These cakes are perfect examples of the imaginations nurtured by this series. I think we need to find a golden Snitch cake like Harry got for his 17th birthday! Lindsay, Yawn because the cakes are boring? or Yawn because 12 years later Harry Potter is still a phenomenon that kids & adults enjoy discussing and discovering? Awesome! John you are not alone, my husband has been listening to the audio cd's in his car for weeks now in anticipation to this new movie. He is squeaking like a small girl about it! LOL Love men into HP! You know what would be even better? For little kids to be reading a WELL WRITTEN 800 page book. Or a WELL WRITTEN 100 page book. 800 pages does not spell "quality". Sadly, Harry Potter is derivative of every other myth, legend and fantasy novel Rowling could copy, steal from, adapt, or rip off. And her prose is lousy, too. How about getting the little guys to read Tolkien, Blume, Cleary, L'Engle, Tannenbaum or others? There are good modern children's literature authors out there, but Rowling really ain't one of them. Great cakes! I like the book the best. I used to be a Harry Potter naysayer. How could something popular possibly be good? In any event, I thought I should start the first book so I could say I gave the series a try. Sylvia, that pic is priceless. I can't say as I blame him, I would have been the same way (still am.) Meals were almost torture for me because I wasn't allowed to read at the table. It was almost a physical ache. Thanks for that last note - getting kids to read is the most incredible gift you can give them, and Rowling's contribution to the world, in that sense, can't be overlooked. Powerful magic, that. And some great looking cakes! Oh how I miss Harry Potter. Is it bad that I got goosebumps reading this post? HAHA. I was lucky enough to see a sneak preview on Friday and can't wait to go back again on Wednesday. The new movie is very good and one of the best to live up to the book (I think). As always, seeing it made me want to reread them all (again!). Wow, great cakes! Can't wait to see more of them. I'm also a big fan of the books and movies. They're just plain fun. @Amanda; If it has HP on it, it can't be a wreck? Well, just google "harry potter cake" and you'll see that there are in fact some pretty scary specimens out there ;). First off, well written is a matter of opinion. I have devoured all of Madeline L'Engle's books. I have also slogged my way though Tolkien (who was also accused of thievery by naysayers). I often wonder who defines "good" literature. Hemingway's "Old man and the sea" was captivating but had one of the worst endings I have ever experienced. Yet that's a "classic." You need to remember that while you can force a child to read, you can't force them to want to read. Rowling, love her or hate her, wrote a book that children stood in line to buy and read late into the night. And if, by reading these "lousy" books, a child chooses to crack open the dusty old "Two towers" on his dad's bookshelf, then all the better. Jim Dale. Is there anyone else, really? My name is Jill. I'm 35. I <3 Harry Potter. Hi Everyone. My daughter is 10 and read all the books in about 6 months... and is currently re-reading them. With all due respect, I'd rather my children be illiterate than read Harry Potter. Thankfully, those aren't my only two options. Believe it or not, there are many other books that draw children into a love of reading. I can still admire the cake artistry, though! Amazing work. I practically bounced up & down with happiness when I saw that this week's Sunday Sweets was HP. I LOVE HP!!! When all my friends were getting into it, I thought "no way, too much hype & drama about it, not interested." After they convinced me to read one, I was hooked. All of the last 4 were read in less than 24-hours... and I am 22 right now. Those cakes were FANTASTIC. The book was a little cheesy, but the castle made me very happy. Keep it up! John you made my night - I have been a huge Potter fan for years now. I love how HP converts kids to reading. I am a 30 yr old teaching student at the moment & have converted the 11 yr old I tutor in English to the series. Love the book with the last words of Book 7. There is no "minor" HP obsession! Well that's just silly. You wouldn't want your kids to be illiterate. I do have to wonder though whether you have ever read a Harry Potter book. Is it the hype or the subject matter that turns you off? If it's subject matter, I always try to remind my anti-Potter friends that Aslan was a talking lion and Gandalf was a wizard. If you're coming from where I think you're coming from, you will know who I am talking about. Loved todays sweets!! Harry Potter is great and Im a grown up too, love it, sad its over but looking forward to the films! Well, John, I'm glad you think it's great for little kids to be reading these long books, but what about Kanye West. How would HE feel about it? This may sound crazy, but I actually teared up at the picture of the little ones reading! HP also got my husband interested in reading. And by reading I mean listening over and over again to the books on CD! Kudos for the great sweets! Thanks for the Potter post! My husband and I are equally obsessed (no kids in our house) and we are holding tight to our midnight tickets. We even took a trip with 2 other adult friends to London for the book 7 release. The castle cake is AMAZING!!! I'm reading The Sorcerers Stone with my 7 year old son right now. Of course, I own the entire series :) and have read it at the very least 6 times (re-read the previous books every time a new book comes out, yeah?). Book 7 I've only read once, though. I ought to re-read it to see if my initial reaction is validated, but I was so disappointed and horrified by it that I can't bear to touch it. Ah well. Books 1-6 were awesomeness personified. Duff's cake is amazing, of course, but that sorting hat is spot on! If you didn't know it was cake, it could easily be passed off as the "real" thing! Keep the HP cakes coming! The book cake was made by Mike's Amazing Cakes. Oh I love HP! Thanks so much for doing the Sunday Sweets for HP. I loved the book cake. I'd actually like to have that one for my upcoming birthday...which, I might add, is the exact same as Harry's. Even to the year! Anonymous @11:10am, if my parents had been as smugly sure that only their tastes were valid as you are and had tried to limit me to Tolkien, I'd most likely loathe reading to this day (and I'm nearly 40). I've tried to wade through Tolkien, and he makes a great printed sleeping pill. As for Cleary and Blume, I outgrew both quite young. I refused to read Harry Potter at first, because of the overhype. I generally find things that are commonly popular to often be mediocre at best. My dad happened to read part of the first chapter of the first book online (at Amazon.com), and ordered the first three books (that's all that were out at the time. He read them, loved it, and when I was visiting one weekend, told me to read them. I loved them. It kinda reminded me that sometimes, things are popular because they're good. I hate Harry Potter with the fire of a thousand suns, but anything that gets kids excited about reading is worth its weight in gold. Word Verification: sumbfit, as in "If I have to hear my coworkers cooing over Daniel Radcliffe one more time, I'm gonna throw sumbfit." I used to really love Harry Potter (hell, I used to be able to recite huge chunks of the first book from memory, because every time a new one came out I'd read them all again to make sure I hadn't forgotten anything), but I don't care anymore. The last book pretty much turned me off the entire series, and I never liked the movies. The space that Harry Potter knowledge used to take up in my brain is being written over with things I'm more concerned about remembering - like the names of all of the characters in Wheel Of Time, and at least a vague recollection of the plot. Because there is a LOT of Wheel of Time. And the names of the characters in A Song Of Ice And Fire, which also has a lot of characters and plot. But then, I'm a mutant child who's loved reading since ever. I read Little Women in first grade. I used to get in trouble with my elementary school teachers and my parents for reading too much. Harry Potter never really caught me more than any other series, and the hype is offputting. Personally, I'll raise my kids if I have them on the books I grew up on. E Nesbit. Nancy Drew. The Boxcar Children. The Bobbsey Twins. Astrid Lindgren. Madeline L'Engle. The Chronicles of Narnia. The Neverending Story. The cakes are well done, though, and sorry about the rant >_< I'm a massive book nerd. In Narnia and Lord of the Rings, the forces of good are clearly good and evil is clearly evil. The characters who are striving for goodness do not dabble in ambiguity. Yes, you've deduced where I'm coming from. The Bible is explicit about avoiding sorcery and divination. When I go to the bookstore and I'm near the display for HP, the managers have helpfully put other books for sale right next to them that they think are similar in tone... and they are books about how to conduct spells and seances and such. I've not seen similar displays next to the Chronicles of Narnia. I've taken too much of your blog space on this already... but only because you asked! You are right about not being able to change minds about this. 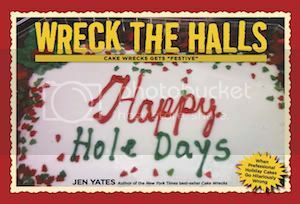 One book that I am looking forward to buying is your Cake Wrecks book. My children love this blog and have asked for your book. I'm going to get it for my son's birthday in October. Best wishes to you and Jen! One problem with the "All was well" cake: The book appears to be open around the halfway mark, not the last page. Love this post! I, also, teared up at the picture of the kids reading at the end. I agree that that is the best thing to come out of the Harry Potter craze. What I loved about Harry Potter was that it made reading *attractive*. One could always go "Hey, if you liked that, try this book!" and you can just see whole worlds opening for these children. It may have not been my favorite series but I still am thrilled at what Rowling did. VillageMom, I'm surprised at your sentiment. It shows a profound closed-mindedness and I'm pretty sure that your children are or will be reading Harry Potter in secret from you. And if they have to do *that* in secret, what else do they feel necessary to hide from you? I wish I had a clue how to begin making cakes like that. I'm 28 and had absolutely no desire to know anything about HP until I was visiting my parents one weekend last September and had finished the book I had brought with me (The Other Boleyn Girl). I grabbed the 1st HP book off of my parents' bookshelf and thought I'd see what all of the fuss was about. I'll admit - I had to really force my way through the 1st book, and was sort of "eh" about books 2 and 3. Books 4 and 5 sort of kept me engaged, and I devoured books 6 and 7! I don't care much for debate, so I won't dive in too deep...and I'll use another book for an example. As a teacher of students from economically depressed homes and backgrounds, any book that gets them "hooked" is a great book. I personally do not like HP books, not MY cup of tea, but they hooked my now 16 yo on reading, and so many of my past students on it too, that I have to LOVE JKR, for the gift that she has given to the human race. You can hate on her and the books all you want, but if they hook a child into the love of reading they are classics. The books turned out to be enough of a wreck for me, the cakes look ok. I like the book cake simply for the sheer beauty of it. It's hard to find something so simplistic and beautiful. very nice. To compare Rowling to Tolkein is to compare a storybook to an instruction manual.... They are different styles entirely! I appreciate both for what they are, but the ease of reading of HP makes it much more child appropriate than the extremely laborious and slightly dull LOTR. I LOVE LOVE LOVE that sorting hat.... the face is amazing! Don't pick on Village Mom. It is her right, as it is yours, to choose the books her babies will read. For now. I think it is a shame that bookstores felt the need to lump sorcery books in with Harry Potter as sorcery, in and of itself, plays a relatively minor role in what is a fascinating story. Magic is part of the world of Harry Potter much as it is part of Narnia and Middle Earth. And there are questions of morality and choices of good and evil. If you have heard your fellow church goers telling you that the books are full of filth and devil worship, I might take it with a grain of salt. Chances are very good that they have never read page one. Okay, I'm done. Jen and I are getting pedicures. Whee. OMG looooove the Sorting Hat! It's just so perfect and just....wow. Hogwarts is also a masterpiece. I can't imagine how long it took to make that one! Pretty sad that kids these days are reading books filled with witchcraft and sorcery and they can't even read the Bible. But the cakes were not that impressive, Harry Potter or not. Wow those are amazing cakes! I love seeing all the cakes you show here on Cake Wrecks, especially the ones on Sweet Sunday. As the baker of the Sorting Hat cake I am thrilled beyond belief to be among the cakes you have posted here today. You have placed me in the company of some wonderful bakers/decorators. It is truly an honor. Thank you! My children and I are huge HP fans and for me it all started with that cake when my son wanted to have an HP party. To get the feel for the world of HP I started reading his books and have been hooked on them ever since. I credit JKR and her books with my son’s as well as my own love for reading. Before I read them I was not a big reader. Now I love reading. I'm just gonna blithely ignore the debate and join John in some serious Harry Potter love. Story time: I was 18 when Deathly Hallows came out. That summer, my parents took me on a 14-day cruise to Northern Europe. We left on--surprise, surprise--the day the book was released. I was in a plane over the Atlantic at midnight (yes, I did count down and bemoan the fact). No, Harry Potter may not be a shining example of children's literature, but you know what? It's fun. It's entertaining. It's certainly better than being absorbed by a television. Interestingly, I came to the blog minutes after finishing Daniel Pennac's Better Than Life which is a treatise on reading and encouraging a real love of reading. At the end of the book is his ten-item "Reader's Bill of Rights" which includes things like "the right to read anything", "the right to escapism" and, applicable to both the Potter lovers and the haters, "the right not to defend your tastes". Also interesting was as I was reading Pennac, I was thinking that I should get out my copy of Philosopher's Stone and re-read it. For me it's like Jane Eyre and To Kill A Mockingbird and A Little Princess: comforting and cozy in its familiarity. I love these books and they got my kids reading. Well, the older ones anyway, the youngest prefers nonfiction. I was never Tolkien fan as the stories bored me to tears. Yes, I did try reading them again as an adult. Classic story of good and evil and a group of teens trying to find their place in it all. I hope this movie is better than the last one, I was seriously disappointed in it. why is it suprising to you that bookstores lump Harry Potter in with Sorcery and witchcraft books? Is that not what Harry Potter is? 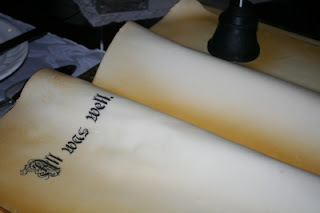 A big lump of sorcery and witchcraft covered up to be some sort of "good" story. And CS Lewis and Tolkien were nothing short of night writers who were in a cult. The devil is going to give kids something that is sugar coated but is evil to the core. JK Rowling is a practicing witch and I would never let my kids read something by the likes of her, Tolkien or Lewis or any other similar to them. It all SEEMS ok, but in reality, it's not. Any who. Sorry. I LOVE your website and visit it everyday. And sorry about writing so much. I get kind of animated on subjects as these because I don't think people use common sense when dealing with subjects such as these. Love this post. But I have two things to say. 1. I find it ironic that someone who claims Rowling is a bad writer uses the word "ain't". Pure irony. 2. To the people who claim HP is devil worship and refuse to let their kids read it because they claim the Bible forbids it....I'll tell you what I told people like you who shopped at the kid's store I used to work at. If your child is unable to separate real life from the HP novels (Ie; they actually would believe magic and HP are real, and therefore a danger), your child is far too young or far too immature to be reading HP. At it's very core, HP is a battle of good vs evil. You say blame the ambiguity of good vs. evil in characters. But that's real life. Your child WILL be faced with situations in which the right thing to do may also be the WRONG thing to do according to others. It's a great story of overcoming adversity, the battle between good and evil and the power of friendship. It is SO much more than "witches and wizards". Anyone who believes differently has not actually read the books. And John (and Jen) I loved that last picture. My brother was one of those kids who did not like to read, until he realized he was capable of reading HP on his own. We'd tried Tolkien, Cleary, L'Engle and many others...but you had to force him to read. Once he started reading HP on his own, he started bringing it to his swim meets for in between events instead of his game boy. He has since discovered the same love of reading that I had as a child, and it is wonderful. Great post. I love Harry Potter. My mother and I have been to soo many premieres and we are super hyped for the new movie. Great cakes, I especially like the 1st one. As an insane Harry Potter fan--THANKS! I love the book cake, that's my favorite line from the whole series! Thanks loads for sharing the awesome Harry Potter sweets! Even though I'm a 38-year-old woman, those books (and movies) make me feel like I'm eight again. To Village Mom: I won't bash your views, I just want to say that I don't think you'll find a better example of love, loyalty, self-sacrifice for the greater good, and good (love) winning out over evil (hatred) than you'll find in the HP books. Rowling is christian and a church-goer. The messages are very good and have provided excellent points of discussion for me and my children over the years. As my kids get older, they get more and more of the deeper meanings in the books. Too lazy to read the comments so I'm sorry if it's been said, but yes the Hogwarts cake was from a premiere, and it was made by Charm City Cakes. My 7 year old just finished reading the series and I've never been more proud. Hogwarts made from GINGERBREAD! the whole thing! it lights up and everything! Whose hand is holding that book for the child on the right??? It's not attached to the girl. Ahhh. LOVE harry potter. I can read those books in no time flat. The Sorting Hat cake is fabulous! The "ambiguity" comment made me LOL. If your life comes nicely packaged in choreographed shades of black and white, I suppose that's lovely. But this is a blog about cakes, not about the oddity of fearing a children's fairy tale. If HP is their appetizer to the "meat" of literature, I'm perfectly okay with that. Heck, I'm into literature and still find it best to alternate with some nice brain candy to avoid burnout. That Duff is a giggling genius. You know what would be even better? For little kids to be reading a WELL WRITTEN 800 page book. Or a WELL WRITTEN 100 page book. 800 pages does not spell "quality". Sadly, Harry Potter is derivative of every other myth, legend and fantasy novel Rowling could copy, steal from, adapt, or rip off. And her prose is lousy, too. How about getting the little guys to read Tolkien, Blume, Cleary, L'Engle, Tannenbaum or others? There are good modern children's literature authors out there, but Rowling really ain't one of them." Funny....Every one of these authors used tons of sources to build their books. Tolkien in particular ripped his story straight from Norse mythology. Shakespeare, touted as one of the greatest writers of all time (if not the greatest), mashed most of his works together from Greek and Roman myths. What's original about the HP series is the way Rowling mashes things up and the story she created from her own head and the influence of others. What's important about her work is that she has so greatly influenced the lives and reading tastes of children from the very first book, and it shows no signs of stopping. Also, Blume and Cleary are often challenged for their content, and they're not exactly the pinnacle of literature. Now, you don't have to like the series, but respect it and what it's' done for literature, and stop thinking that just because you like it, it's good, and just because you don't, it's bad. Wow, the Hogwarts cake is amazing. But it would be an act of sacrilege to cut into it! VillageMom, I find it interesting that you like Tolkien (I presume we're mainly talking about Lord of the Rings, here, correct me if I'm wrong) and not Harry Potter on the basis of Christianity. For one thing, there are plenty of wizards in The Lord of the Rings. For another, and far more importantly, at least when it comes to this debate, Tolkien explicitly said, over and over again, that his stories were not meant to be allegorical of the Christ story (as The Chronicles of Narnia were). Rowling, however, has said that the story of Harry Potter is meant, in some way, to reflect the story of Jesus Christ. I'm not attacking you, you're perfectly entitled to your opinion, I just wondered if you knew this. Anyway, that aside. Thank you so much for this post! I've loved the books since I was nine (Rowling actually came for a book signing in my school before she was famous, as it's in her home town, but sadly I didn't own any of the books then), and really have grown up with them - they remind me of my teenage years so much, with all the bittersweetness that entails. I was an avid reader before Harry Potter, and the plot may not be the most original, but I LOVE IT. I've always always LOVED reading! I think the first ever chapter book i read was "Are You There God? It's Me, Margaret." I think I was 8 or 9. I never did understand why my peers weren't into reading. I still can't understand why it's so difficult to get kids to read; I am stoked, however that Harry Potter changed that. Alas, I am also an addict. I have to read the books *at least* once a year! I'm still holding on to the hope tha JK Rowling will release that fabled encyclopedia. I need just one more fix. The Sorting Hat cake is wicked awesome. Total win. Not to ignore the HP awesomeness happening here today, but have any of you checked out the cakes at Mike's Amazing Cakes?? I saw his comment as I was reading through, and, since I loved that book cake so much, I had to take a look. These cakes are STUNNING...if only I had a special occasion coming up that required a cake! Wow, wow, wow. I'm in awe. "Little kids reading 800 page books - now THAT is Sunday Sweets worthy." Whooo HOOO! Couldn't agree more! VillageMom, don't let the nay-sayers try to make you feel bad. You can choose to let your kids read or not read whatever you feel is best. To those of you harping on her for being closed-minded or ignorant, shame on you! Her reasons are hers alone and assuming she did no research or put any thought into coming to her decision shows you are being just as close-minded and ignorant! If a kid discovers a love of reading, does it really matter what kind of author or book awakened it? Not every book has to be a stellar classic of literature. Everyone does not have to like the same kinds of books. Go to wikipedia, read the plot synopsis for the Harry Potter Books. THERE IS NO AMBIGUITY. Love, compassion and mercy are big themes in the overall series. As a matter of fact, they are presented as being far more powerful than the strongest and most evil magic. Please don't deprive your children of a great story without researching it for yourself. Exactly! That's what got me to read them in the first place. I worked at an elementary school and I figured anything that got the kids to read such big books had to be special. 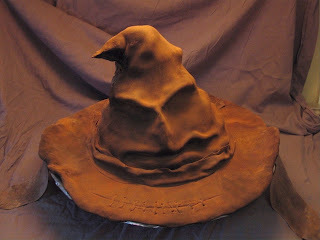 The sorting hat looks like it's covered in chocolate powder, like a giant truffle or something! I love it when you're on Food Network Challenge! Keep up the awesome work! Check out their website if you haven't. They mean it when they say, "Amazing." WV - dental - This is the first time I've had a word I recognize! Yay! Wonderful cakes...the sorting hat looks like it may say a few choice words any minute ! I especially love your thoughts on the last photo of the children reading, since Harry Potter books have made it cool for boys to actually read too ! Wow, this blog has really become a rant/attack center, no matter what Jen or John post. I used to get a kick out of all the truly funny and clever comments readers posted but now I'm afraid that there might be a little too much pontificating going on. oh my gosh, you are both so funny. I wish my husband did hilarious posts on our blog, so we could be a tag-team of hilarity, too. I still love him, though. Good job, john. Amen, Amen, Amen!!! Great books! Great cakes! GreatEST kids! It is lovely to see how much a series of children's books can inspire a group larger than its target demographic! People who read ask questions, after all. With the impending release of the sixth movie I've been rereading the series for the last several weeks (Deathly Hallows twice!) These cakes make me happy. Thanks for posting them! Yes, they are reading 800 pages but is it QUALITY reading material? Before you answer that I make my children read text books. Anonymous -- I, too, did not think they would live up to the hype. I didn't read the first book until after the second movie was out, but since I'm a teacher, I finally gave in. I found out that I was wrong all along. The books are awesome, and while the movies don't do the books justice (do they ever? ), they are still worth it. Rowling's writing is far more advanced and her storylines far more complex for the ages that are reading the series, yet they continue to read, comprehend, and love them. That's not hype -- that's phenomenal. Ok, speaking as someone who appreciates the Harry Potter series AND a fundamentalist Christian, I'd like to assure those folks who claim to know everything about the books and the author yet obviously do not (for one thing, Rowling belongs to the Church of England. Take that as you will, but I'm pretty sure they aren't a bunch of satanists, no matter how liberal an interpretation of scripture they may have), that the books, at their core, are not about magic. They are about friendship, love, loyalty, and bravery. And above all else, they are about good defeating evil. The magic in the books is no different than the magic the fairy godmother performs in Cinderella- it's nonsensical, silly words. You have every right to pick and choose what you want your children to read, but it might behoove you to pick up one of the books yourself, before you judge. I don't claim to know everything about what Jesus thinks, but I'm pretty sure he doesn't have a problem with fantasy or playing pretend. This is what the HP series is. As to bookstores setting up displays of sorcery and witchcraft near the HP books, I highly doubt that. I spend most of my free time in bookstores, and I work in a library, and never before have I encountered such a thing. It seems particularly implausible since the books are intended for children. Do they set up adult books about Christianity near the Chronicles of Narnia series? No. To those of you who dislike the Harry Potter books because you don't think they're "quality" material, not worth kid's time, etc., may I remind you that these books were originally meant for children? They don't HAVE to be great works of literature. They are, incidentally, fantastic stories that spark a love of reading in children. I am a librarian who primarily works with children and teens, and I have seen firsthand this magic that Rowling has let loose. I have kids come in that want to read more about the background of the series, which then leads them to other famous works of fiction AND nonfiction books- many that adults wouldn't check out- about mythology and folklore. Who knows where they will be led next? It gives me hope for children in our country. For every child that comes in whining and complaining about having to read a short novel for school (is it really so difficult for an advance placement high school senior to finish "Lord of the Flies"? ), there is another who is reading at LEAST two or three grade levels above his own, owed in part to the Harry Potter books. It's fabulous, honestly. "If a book shakes my faith*, I didn't have much faith to begin with." To expand upon this idea further and in a more personal way, when *I* read the Chronicles of Narnia, I was ignorant of C.S. Lewis's original intent (I think I was.... all of eight or ten? Maybe?). I loved the books, but ironically, the end result of reading them was to encourage me to consider atheism! And yet, Narnia is considered by many Christians to be a very "Good Book," whereas Harry Potter (which never made me consider anything deeper than "oh, I'd like to eat a chocolate frog, too") sometimes makes the blacklist. I guess my point is this: no one book should be considered "bad" or should be banned from any household. Any faithful child will not have their faith shaken; any child with doubts is likely to have had the doubts anyway. And *all* creative children will manage to find a message in any book they enjoy that jives with who they are and what they want to be. That last part, by the way, is a big part of what books--all books--are about. The sorting hat cake is amazing! They've actually manage to make it look like it's speaking. And the Hogwarts cake is stunning. Thanks for the Harry Potter cakes, it pretty much made my day! What's the point? There are a lot of things that are featured on here that I'm not a fan of. Star Trek, Transformers, among other things, but the cakes are still the main point of this and if everyone were to nag every time something they weren't a fan of is featured, this would be one sad blog. Jen and/or John aren't here to cater to all our individual likes and dislikes. So when you see something you don't like, pass it by or focus on the cakes? We're all here for the crazy/ugly/amazing cakes, so I don't see the point in ruining the fun for everyone else. If I remember correctly (High School was so long ago...), Lewis was once very very much an atheist. Tolkien, on the other hand, was very devoutly Christian. He and Lewis became good friends, Lewis changed his faith, and Lewis began changing his writing to reflect his newfound love of God. I don't suppose it would be too much of an exaggeration to say that Harry Potter saved my life when no other 'Christian' literature could have. In the depths of a depression I somehow managed to stumble upon The Sorcerer's Stone. Reading through those wonderful books was the only thing that kept my mind occupied with things other than self-harm, pity, and despair. I am a Christian, but I will tell you that all the prayer in the world did not have the same effect that Harry Potter did. Now that I have recovered from that dark place in my life, it makes me EXTREMELY sad and angry to think that someone might be banned from reading those life-changing books due to ignorant ideas on the part of those who have most likely never read them at all. I read the first book in the HP series and didn't care for it, so I didn't read the rest. So what? I didn't like Tolkien either, but I could still admire the cakes based on LOTR. Isn't that what this blog is about? Cakes, not books. I felt the first cake was a bit lacking, but the book one was beautifully done. Oh that is so adorable. You could get into so many women's pants like this (sorry Jen, don't hurt me). However, now I want to read the books again, dammit. I'm just reading the leas part of the Harry Potter. It's so great that I can't move away from it. Every second word that I say is Harry Potter related haha. I love this cakes! They are so beautiful. And since I'm commenting for the first time: Your blog is amazing! I love it! I check it every day! 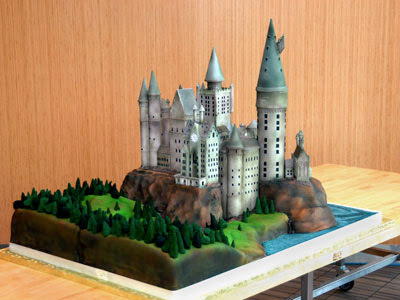 That Hogwarts cake is sooooooo cool!!! I *need* the Sorting Hat cake! And the book cake!! You're kidding, right? You'd never let your kids read C S Lewis? You realize the Chronicles of Narnia, specifically The Lion, The Witch and The Wardrobe, are the story of Christ clothed with the mantle of fantasy? As someone who never had to be "encouraged" to read, but realizes there is a huge problem when kids think reading isn't cool -- and sees schools sending out nearly illiterate teenagers out into the real world, I think anything that gets kids reading is great. If it teaches lessons, like the world isn't always black and white, loyalty, friendship, then all the better! omg yes! I am so happy to finally see some HP action on cakewrecks!!! Well done! There's something about a book that can gather a whole generation, young and old, to cry together, laugh together and share a certain ounce of pride in a 17-year old orphaned wizard. I love the series, and I am God Willing, going to the premiere at midnight, dressed up as Tonks! Thanks so much for the sweets of Hp-ness, but i'd love to see some wrecks too, I mean some people try so hard to dedicate a cake to the great teen hero, and fail so miserably, that we have to appreciate it together, just like J.K. intended. im not sure if anyone else mentioned this yet, but my favorite harry potter movie is called "dear, readers: Wizard People" it is a hilarious dubbed track by a man named brad neely. he doctored it and showed it to his friends in austin, it is now a worldwide sensation! The book cake with the last line quite literally gave me chills. At first I thought it was Tom Riddle's Diary, but I like it more as is. What a lot of fuss caused by these cakes! Of course its really HP and the Philosephers Stone, The American Publishers thought you lot wouldnt "get it" with the correct title. Reading is what counts once you can enjoy it the world is in your hands even if you never go further than your local library! I read like other people breathe,but over the years my tastes have changed Ive read Good Literature and trashy romances,the bible cover to cover more than once and poetry. But only one of my 4 children is what I would call a reader, they can read but they dont live the book! I wish they were as keen as me its not for lack of encouragement! !But they find their own path. By the way HP is very British you know,its great to see so much of the rest of the world loving it!JK wouldnt allow it to be Americanised!! I propositioned Jen after the Princess Bride cakes... Now I want to proposition John... You two Rock!!! Only, I also want to read the books all over again. WV: mousktol - a laxative for kitties? I fought the HP hype for 3 books. Finally, I sat and read the first one and quickly devoured them. I waited on pins and needles for each book. I didn't think I would like them because I have been such a big reader from such a young age. I have read, and re-read Tolkien. I started Wheel of Time. Wonderful cakes! Love your blog. This post makes me *so* happy, you have no idea. As another poster said, Harry Potter was my childhood; I loved the series to death, and they were my go-to books when I was stuck at home sick. I still reread them even though I'm now in college, and although the movies are nowhere near the quality of the books, I already have my ticket and will be there at midnight. Possibly in costume. As far as arguments against the books go, I think people who dismiss them for religious reasons have never read them. Yes the characters are wizards, but the strong themes of the series are love and friendship. There's a very distinct line between good and evil, with maybe the exception of Snape who has been forgiven for his past deeds. That was my two cents. 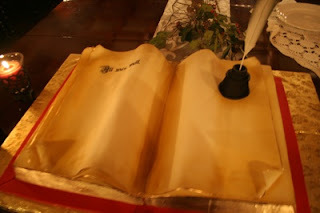 As for the cakes: they are breathtaking and the book cake is especially poignant. But the picture of the little kids with the books is in a class of its own. Wow. Amazing. Some people just go way out there to do wonderful pieces like these. Nice to know there are some professionals who actually do good work. On a side note, my sister introduced me to your blog and I love it. She's been reading for over a year and I just took the day today to go over 2009. Gonna need another day to go through 2008. *face palm* How do some of these people keep their businesses? ABSOLUTELY CAN'T WAIT FOR THE MOVIE RELEASE... the day after my birthday. I'm getting tix for a present.. I hope. And, yes, my favorite thing about the books is exactly that... they got children everywhere back into reading again. YAY! I LOVE HARRY POTTER! Thank you, Jen! I love, love, love that sorting hat. I want one. Do you think if I chant, "I wanna Sorting Hat" 275,000 times it will happen? No, wait, that's my kids' strategy, not mine. I really wish JK Rowling had continued to use an editor right through the series, but the books make such a great rollicking good tale, I'm not that fussed. oh those are AWESOME! I'm so excited for the Half-Blood Prince movie. I'm going to the first midnight showing I've ever been to (thanks, but not to the fact that our local Imax isn't bringing in the film until 2 weeks post release date. What's with that, anyway?). Can't wait to see the rest of the HP sweets! YAY Harry - YAY! I loved that my 10 year olds gave up they're game time to READ when the 4th book came out. It made me so happy. Those cakes are awesome! I love the sorting hat. I actually watched the episode of Ace of Cakes where they made the Harry Potter cake. The staff from the bakery made a point of going to find a knife and plates and cutting into the cake when they overheard people talking about not eating it. They made a very good point. Pretty or not, cake is MEANT to be eaten. Otherwise, they put all that work into it just to see it go into the garbage. And yes, the castle part is styrofoam covered in fondant, but the grounds are made of cake. To Anonymous @ 4:50: You make your kids read textbooks? I pity your kids. Nothing put me to sleep faster than reading my textbooks at University. And I loved the subject matter. They're just dry and boring. And by the way, just because it's a textbook doesn't mean it's QUALITY. I've had a few classes where the prof told us NOT to buy the text as it was bad. On the general subject of reading, I disagree with people who limit their children's opportunities to read. I recognize that that is their right as a parent, but I DO disagree with it. I will never tell my children that they cannot read a book. I WILL, however, ensure that I teach my children to recognize what is real and what is fictional. I think that's the more important message to pass on to your kids. Those are freaking Awesome cakes! The detail on them is fascinating. And yes, despite the naysayers (Hi, Dad!) the HP series did get kids reading. And that, my friends, is a good thing. I can't weigh in on the HP love. Yet. I'm holding off on starting the series until I can read them to/with my children (now 4 and 2). That will be fun. What's going on in the close-up photo of the Charm City cake? It looks like an angry blonde woman with sunglasses on her head getting a back massage. I *heart* Harry Potter. :) That Sorting Hat cake is AMAZING! I do not agree with john. Kids may read them but it does not mean it is a good book. I do not agree with filling our children's head's with witchcraft! So what if they will read it! your kid may be willing to watch r rated movies but it does not mean it is fine for them to see. Come on every one! We need to guide our children and have them read good books so that they can have a very fulfilling childhood! I love how everyone has a Harry Potter story (how they got into it, what they've done bc of it etc etc). We'll also share them at the drop of the name. Those are great! 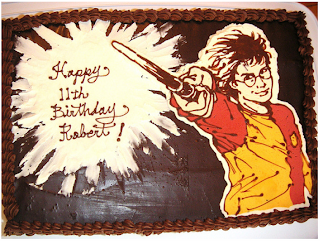 I had a Harry Potter cake for my birthday one year, but it wasn't anything as cool as those. It was just a regular ice cream cake with the Hogwarts crest on it from Baskin Robbins. 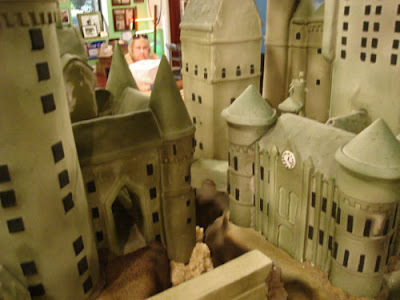 I saw the Ace of Cakes with the Hogwarts cake, I remember that Dan Radcliffe really loved the cake. Today's post makes me miss the book release parties...particularly the amazing festival that Oak Park put on where the entire downtown was involved, including businesses transformed into Diagon Alley shops. Ooooo. I want all of those cakes. I don't so much like the movies, but I adore those books and have read them a lot. They probably would end up like me as a kid, carrying a backpack that is way too heavy and makes grown men strain. I just wanted to say that I truly appreciate the active discussions we have on this site. It's odd when you consider it's a cake site. I want to make one more point, though, before I move on with my life so please bear with me. What if you had never seen "The Sound of Music" and someone told you it was all about the Nazis. Would you want to see it? What if you had never heard the 1812 overture and someone told you it was just a bunch of cannon explosions? Would you want to hear it? What if you had never had chocolate and someone told you that it gives you pimples? Would you want to eat it? I believe it is unfair to pass judgement on something you have never experienced based upon the opinion of another. If you don't want your children exposed to magic, then by all means, don't let them read Harry Potter. But you should also keep them from Disney, and Narnia and Middle Earth and probably even the Bible, which is full of all kinds of supernatural things. And please don't base your opinion of a book on hearsay. Read a chapter. Learn for yourself whether your friend or sister or Pastor has any real concerns. Then decide. Thank you so much for the Harry Potter cakes!! Now I'm definitely going to have to go back and re-read them all again! In looking back, I consider myself very fortunate that my parents never censored my reading material. I recently went to my 25 year reunion and when talking about what we remembered about everyone else, it was always my books, my reading that everyone recalled. I read Gone With The Wind when I was 10. I read trash and I read fine literature and I learned from it all. I would hide a book inside my textbook when I was done reading the assigned pages. I always got in trouble for it and not one teacher ever bothered to find out that not only had I read the assignment but I had read the entire textbook by October. I read the backs of the ketchup bottles in restaurants and every ad on every paper placemat. I now read while I brush my teeth and while I stir the spaghetti sauce. There is nothing so magical as a book and I won't be a snob about 'literature' because every bit is learning. It is pure joy. Wow! Hoping to get a comment in here before John, Hubby of Jen, decides to close down any more arguments by closing comments. heh. I won't debate this (because I have very strong feelings about HP), but I do want to say THANK YOU for these awesome cakes!!! They are beautiful! I also thought the book was Riddle's diary at first, but I love the last line. Just great. Ooooooh! I'm thrilled you posted Harry Potter cakes on my 30th birthday!! I'm a huge fan of Potter and Cake Wrecks, so it's like I got one last present today. Just finished listening (yet again) to the great Jim Dale read all 7 books to get me psyched for the movie. Looking forward to more Potter sweets next Sunday! Harry Potter is not simply about witchcraft and magic. It's about the power of friendship, loyalty to those you love, how to face your fears and still do the right thing. The classic battle between good and evil and overcoming the evil within ourselves. How can a story like that be a bad thing? Someone mentioned out that the Tolkien book had clearly defined good and evil. But, is LIFE that way? Holly at 11:55, I was lucky too--my parents never censored anything I read or even watched on tv, and I think it make me a more mature young adult. I never felt the need to explore "all that stuff my parents never let me do" like so many kids do. I was given the first book when I was about 8, and though I have always loved reading, Harry Potter just can't be beat. To think she came up with that whole amazing plot on a train, and didn't even have anything to write it down on. My best friend and I could argue for hours about harry potter. Before, we'd argue about what would happen in the next book, now we theorize about what they'll cut or destroy in the next movie. People say they couldn't get through them or that they're boring and to those people I say: WHAT?? Thanks for posting these awesome cakes. If you search the charm city cakes one on YouTube you can see the clip from ace of cakes. That's sort of the point, MAKE them read, wouldn't it be nice if they CHOSE to read something that they truly enjoyed? I've read a million and one books (at least) and remember most of them, and the ones that always struck me, and caused a stir inside my chest were the ones that were about true friendship, and loyalty and most of all about love. From a witch (yes really) who was raised a witch, who has read and or studied the bible, the story of Siddhartha, the Qu'ran, the Torah and, best of all, Harry Potter. Jon - excellent argument. I applaud you there. To all those who are saying that harry Potter isn't real literature, and/or it's not good quality - why let kids read it - I am not going to argue with your parenting styles, because I'm not a parent myself, and just because I feel one way, doesn't mean everyone else should conform, but let me just say this. My brother and I grew up together and we were completely different. I was the studious one, at age 5 I had already read some Shakespeare, and Dickens. By age 11, Romeo and Juliet were my inspiration for love, and Tolkien was my idol. My brother, on the other hand hated reading, didn't even do his reading projects in school, he just asked me what the book was about. When Harry Potter came out, my mother picked it up thinking my father might enjoy it. He ended up reading it to me and my brother. It was like a bit of magic had come to our own lives. I fell in love with the description, and the prose, and the way I fell into the story. I literally saw the world morph into Hogwarts around me. It was a book that felt just as exciting as any classic, but was still fun and modern. My brother liked it because t was an escape. While he read Harry Potter, nothing else mattered. The world disappeared, and he was just a boy experiencing a magical journey. The books even got my brother into reading. He started on Tolkien and then moved on to other fantasy, finally settling on sci-fi. Although we were both very different, we both loved Harry Potter, even though it seemed unlikely that we would. That's the wonder of this series. I say, give it a try. Let the kids decide if it's bad for them, but I have a feeling you might be surprised at how they change through the series, right along with Harry. Like I said, not place at all, but I just feel pretty strongly about letting all sorts of magic into your life. I was a big HP hater, i hated the hype, i hated the idea, i hated everything about it because as a Witch, i felt it made a mockery of my faith. However, i expressed a curiosity to go see the first film when it came out 8 years ago after seeing the trailers and a friend impressed upon me to read the book first as the film left some stuff out. So.. i trotted off to Asda and bought it for a single pound. Love the cakes! I'm torn on the favourite though, i adore the castle, but the hat is also awesome. Its my wedding anniversary on Friday, my hubby who dislikes the potterverse is taking me to see the new film! I don't want to start another debate here, but am I the only one that thinks the 1st HP cake is terrible???? It doesn't even compare to the others, but the character and the flash coming out of the wand look a little wrecky to me. Hey dudes, where's my posting? The one in which I was Offended because the protagonist of these books is white. and male. and heterosexual. Or did it just get drowned in the general "Harry Potter is Evil" furore? Love you guys and everything you do. Avid Harry Potter fan here. The hogwarts castle and sorting hat cakes are super awesome! Hell yeah! While making reading "cool" has gotten JK a special place in heaven, the books pulled off something else as well. About three books in to the series, my nephew had his first eye exam and flunked it. The reaction of all his friends? "Cool, you get to wear glasses!". Trust me, that was _NOT_ the reaction his father and I got when we got our first pairs of glasses. I adore the HP books! And these cakes are fantastic! Oh to have the time and patience to make such things. To those commenters who have mentioned CS Lewis in their "it's the Devil's work I tell you!" rants...CS Lewis was a devot Christian and the Narnia books were meant to teach children about God and Christianity. @Jamie...Aslan represented God, my friend. He sacrificed himself on the stone table to save Edmund from his "sin". You really must know more about these things before you comment. Cat, Tolkien said in an interview that Gandalf (the "wizard" in his trilogy and The Hobbit) was actually meant as an angel. Saruman, his nemesis in The Lord of the Rings, is a fallen angel doing the bidding of Sauron. So yes, Christianity is explicit in his works. Lewis' evil characters (the White Witch, Jadis) use magic and sorcery, but Aslan does not. He is a Christ figure. Tolkien and Lewis are lightyears away from Rowling and Harry Potter. Both in writing and message. Lewis and Tolkien's characters draw strength from believing in a higher power; Rowling's characters' strength comes from mastering sorcery and believing in *themselves*. Very different messages. I am not a fan of HP but it helps to get children to read. My daughter is an advanced reader and we were running out of books for her to read. So when she was 7 in the 2nd. grade she began to read the HP books. She has read everyone twice. She is now entering the 5th. grade reading at college level. I don't have to respect the books, either. I don't. I respect Rowling for dragging herself out of poverty and finding something that seels. But things that well well aren't necessarily quality. Look at McDonald's. Look at the (shudder) Snuggie. You can't make kids want to read. Well, sort of. You can. Model good behavior. Read to them when they can't do it for themselves. Over and over again. I grew up watching my parents read every day. There was always a book on the bedside table, books in shelves in every room, books stacked next to chairs, When I couldn't read, they read to me-every night. Reading was never presented to me by my parents as a "chore". It was a pleasure! Consequently, I was several years ahead in my reading and comprehension skills. Kids shouldn't have to be forced to read. If they grow up in a reading environment, they will become readers, avid readers. Read them good literature-from any era. Buy them books, lots of them. Be a role model and show them. Kids who hate reading come from families, parents, and home, where reading is rare and TV rules. And yes, I AM a teacher, and I DO lament the students I have who see reading five paragraphs as "too much work". Guess what? Their parents don't read. I'd rather kids read Harry Friggin' Potter than be illiterate, though. I don not agree with organized religion banning a book because of "sorcery". I can't see the difference between the good luck spell and the miracle of the bread and fishes. These are some great looking cakes. Watching Duff and crew make the Hogwarts cake for last year's movie was awesome! My favorite has to be the book one with "All was well" simplistic, but so much meaning for those of us who read Harry Potter. Also, love the picture of the children reading, that has to be the best thing is that the youth is out there and Harry Potter has gotten so many of them to read more! Harry Potter cannot be compared with "The Sound of Music", or "The Chronicles of Narnia." In the "Sound of Music," it was CLEAR that the Natzis were evil. Narnia had very clear distinctions between good and evil, and Alsan represented Jesus Christ. The "Sound of Music" shows the children's father and later stepmother as people they can trust and love. HP only shows Harry's family as despicable. It is very important for children to know that ALL witchcraft is evil. Moral relativism is wrong as we can see with the downfall of the family, through divorce and children being born out of wedlock. "A Landscape with Dragons" by Michael O'Brien is an excellent book for any parent who really cares about learning how to differentiate between good books for children, and books that can be harmful to their mind. Oh, I SO agree with you! My son and I read the series together...and I sobbed through the last one because I knew our time with Harry was coming to an end. What a great series, great message...I love that these books can be enjoyed my kids and adults alike. Thanks for sharing these cakes! I am hiring a sitter so hubby and I can go to the midnight showing. We are in our thirties...NEVER get a sitter and NEVER go to the movies....well guess what...we are! I adore that sorting hat cake. WV: medness. Most of us have a slow descent into Madness, wreckerators get Medness for their deviant ways! I love the series and all the great cakes that come with it...thanks John...and don't feel bad about being that old guy at the midnight premiere! Wow! What a debate! Jen, I must admit you have a real winner with John, you are so lucky. John, your argument is very similar to my own, but you put it so much better than I ever have been able. I hope you won't mind if I borrow your allegory next time I'm debating books. At some point or another, your child is going to go into the world without you. You won't always be able to stand between them and all the gray areas that exist. Is our human free will really that susceptible to negativity that a work of fiction will completely remove our faith? There are plenty of examples of things that have actually occurred, (i.e. the Holocaust, Katrina, etc.) that have done more to make me question God and faith then any work of fantasy ever will. But I have also seen and experienced real life miracles that have renewed my faith. That being said, the right to have differing opinions is what makes America great, I'll defend to the death your right to believe completely the opposite of me. This post made me squee so much. I used to help run our local bookstore's midnight release parties, and I kind of miss that level of excitement. More than that, though, John, you gave me the chills. Your eloquent responses to all the debate are enviable. I wish I had thought of half as poignant a response for the naysayers at the bookstore. Samcarter, angels are not limited to Christianity. Even if Tolkien were referring to angels, I didn't say that Christianity isn't present in the books - I said that the Christ story is not. And it isn't. Frodo's (and The Fellowship's) fight for Middle Earth, as far as I am aware, was *not* meant to be allegorical of Christ's life and his battle for humanity. Rowling has said in an interview that the Harry Potter series *is* meant to be somewhat allegorical to the story of Christ presented in the Bible. Magic may be used in different ways in these different series, but Harry Potter has more in common, at a fundamental level, with The Chronicles of Narnia than either do with The Lord of the Rings. Oh, Harry! I *love* that book cake! Beautiful! And the sorting hat is amazing! As a Christian, I have never read a more beautiful depiction of the story of Christ than the one JK wrote into Harry Potter. The Harry Potter phenomenon was a fantastic opportunity for the Church to spread the gospel in a way that people would understand because people who would never set foot in a church read Harry Potter. Instead, what did we do? Sit back and moan about the "witchcraft" and evil and pronounce a judgment on something we knew nothing about. I am ashamed of how so many of my Christian counterparts have behaved about this series. Unfortunately, I also know that those diehards will fight until the bitter end without ever cracking a book to get the real story. It's disheartening, really. To say that Harry's family is only portrayed as despicable is misleading. In the earlier books, they certainly are. As the books progress, however, it becomes quite clear that Harry aunt, uncle, and cousin are both scared and slightly envious. Dudley, once Harry's tormentor, matures and he and Harry reach an understanding before they part. Rowling has gone on the record as saying that Dudley and Harry remained on "Christmas card terms". Also, the Harry Potter series makes clear distinctions between good and evil. The issue is that the HP world, much like our own, "isn't divided into good people and Death Eaters". Not all on "our" side are those we wish to ally ourselves with. There are people who do truly evil things for good causes, and vice versa. I'd say there's really only one character throughout the series that's ambiguously good or bad, and he is ultimately redeemed as we see his story. Much longer than I planned, but back to the original post: The cakes are beautiful. The Sorting Hat is fantastic, and that book's simplicity is breathtaking. :D Love it. Can't wait until Wednesday! Hi John, this is a great post and I just wanted to let you know that my husband has probably read this series over 20 times and I'm hedging my bet that we are a tad bit older than you and Jen. Oh yeah, and please please please do some HP wrecks! Am I the only person on the planet getting tired of Charm City Cakes? Yeah, they make awesome cakes, but half the time, a good portion of the cake (or all of it) is not actual cake. See the Milkbone box "cake" which is plywood covered in fondant. No actual cake in the entire cake. Sorry, just me I guess. I'm not sure what amuses me more... that a cake/humor blog incites so much passionate discussion about literature or that I am in the minority in not really caring for the HP series AND not caring if kids read it. I don't object to the subject matter, but also don't think it's necessarily quality writing. The later books especially get very clunky and are difficult to read out loud. Some of it I think is differences in British vs. American English, but some of it is just poorly constructed writing. They're not Shakespeare...but then again they're not meant to be! I don't think anyone is arguing that all children should read is HP. Parents have to provide kids w/varied reading materials (including non-fiction) just like they provide kids w/a varied diet. I love the post. Seeing good cakes based on figures from popular culture is always fun. Thanks, John. And thanks for your passionate defense of critical thinking. All this crying "witchcraft!" reminds me of the satanism panic of the 80s. Remember all those kids who were being "abused" by "satanists?" 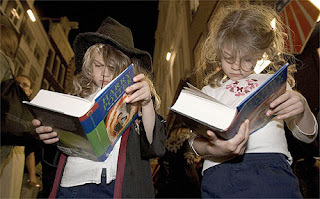 I guess they are now the parents of these witchcraft-loving HP-reading youngsters. Anyway, Hollym I loved your post about the joy of reading anything en everything. I feel the same way. And I read the backs of ketchup bottles, too. Wow, that 2-d one was indeed awesome! Very cool effect. Seriously, if you’re that worried about a book changing the moral compass you’ve instilled in your children than maybe you need to look at your own teaching methods. For frick’s sake. I too love Harry Potter, et al, far more than a 38 year old should. The sorting hat cake is "saaaweeet!"!! Very neat, but I was disappointed when I saw the Charm City Hogwarts cake on Food Network - the castle part appears to be entirely styrofoam. So, while it's a really cool-looking construction, and the landscaping that WAS actual cake is a pretty awesome feat of pastry (none of the actors actually wanted to eat it and spoil the work of art), I feel that since the main focus of the cake (the castle) was not in fact cake, then it shouldn't be a Sunday Sweet. Now if I'm wrong about the styrofoam, someone correct me and I'll take it all back. But that's what it looked like on Ace of Cakes. I have to laugh at 'make it fun and they'll read. Not always true. (I am the ketchup bottle reader). My mom enjoyed reading although it wasn't a passion for her and she put it after many other things. My dad, with a 10th grade education didn't enjoy reading much. I love it, always have. I read to my kids when they were babies and toddlers. I bought books, whatever they might be interested in, as well as books to read together (Charlotte's Web, Runaway Ralph) at night. Books, books books FILL my house, are stacked beside chairs and bed (mine), on the kitchen counter. I never censored reading material. When they removed 'The Giver' from my son's required reading, I went out and bought a copy to see why and he and I both read it and still rate it as one of our favorites. Alas, neither one of my boys are prolific readers. My oldest enjoyed the Goosebumps series and a couple of sci-fi series but it's not something he does on a daily basis. My younger son reads well but doesn't much like it. He'd rather be outside, moving. Even books about slithery, slimy things only get a glance. You CAN lead a child to books but you can't make them love 'em. Unfortunately.